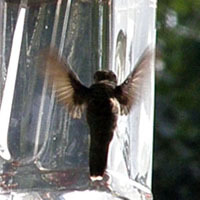 You are at:Home»Posts Tagged "bird feeders"
I adore hummingbirds. They’re such pretty little creatures to have fluttering around the yard. Every Spring I look at the old note I have stuck to the inside of our recipe cabinet to remind myself of the right sugar to water mix ratio before I make the first batch of food and set the feeders out again. So today I thought I’d share the hummingbird food recipe and how I make a batch. I’m also including some of my favorite pictures, my favorite place to buy hummingbird feeders, and what I do to keep the feeders clean and nicely filled all Spring, Summer, and Autumn. (ARA) – Backyard bird feeding is an easy way to enjoy wildlife up close and personal. Feeders, and the beautiful birds that perch upon them, can brighten up any garden or yard. More important, however, is that bird feeding is very beneficial to the outdoor pets we adore so much.